I didn’t post something with pumpkin yesterday. It was a landmark moment! I diverged from that ingredient for one day. But in keeping with a consistent pattern here, it’s back! Hooray! It’s ridiculous, but I’m still not sick of pumpkin. Are you? The novelty hasn’t worn off yet for me. Today though, I’m bringing you something genuinely healthy. It’s not one of those recipes where it’s actually dessert disguised as breakfast. Or dessert disguised as fruit. This is legitimate health food. It probably doesn’t seem congruent with how many desserts I post here, but we do eat pretty healthfully most of the time. I swear we do. We take a lot of desserts to family events, or we freeze stuff. It gets spaced out. In between, I bake healthier alternatives. On Sundays, S.O. and I cook and prepare food to pack for lunches for the week, and these bars are a staple. They’re very versatile, so you can mix up what gets tossed in as ‘extras’ like fruit and nuts. We make them at least once/month. More accurately, I make them. He just eats them. I’m not complaining though because he has to do the real dirty work like touch raw meat and stuff. No thanks. In a million years, you’d never guess that these are healthy. They are stuffed with so many good-for-you foods though. 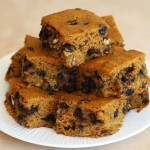 They are so moist and delicious, and the flavors are amazing. 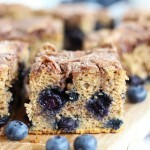 They’re like the best pumpkin muffins you’ve ever had, but in bar form, plus nuts, blueberries, and cranberries. Btw, I have to point out that blueberries and pumpkin are a match made in heaven. Were you aware of that? 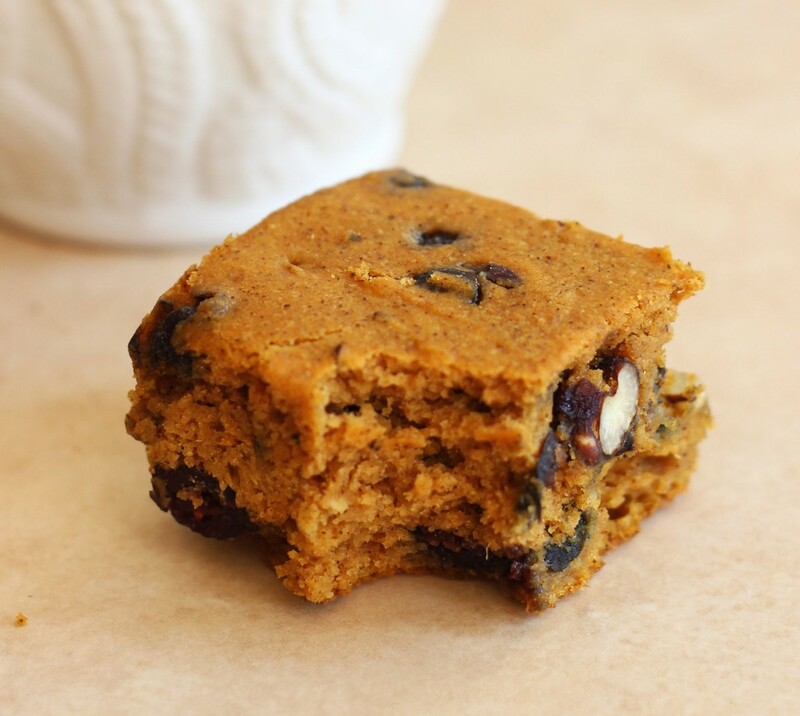 This is our favorite version because we’re pretty giddy for the blueberry and pumpkin combo. Since these also pack a protein punch, you’ll find these are quite filling and stick to your bones! Did I mention they’re ridiculously easy? You don’t even need a mixer. You can stir these up by hand, and they’re out of the oven in 20 minutes. 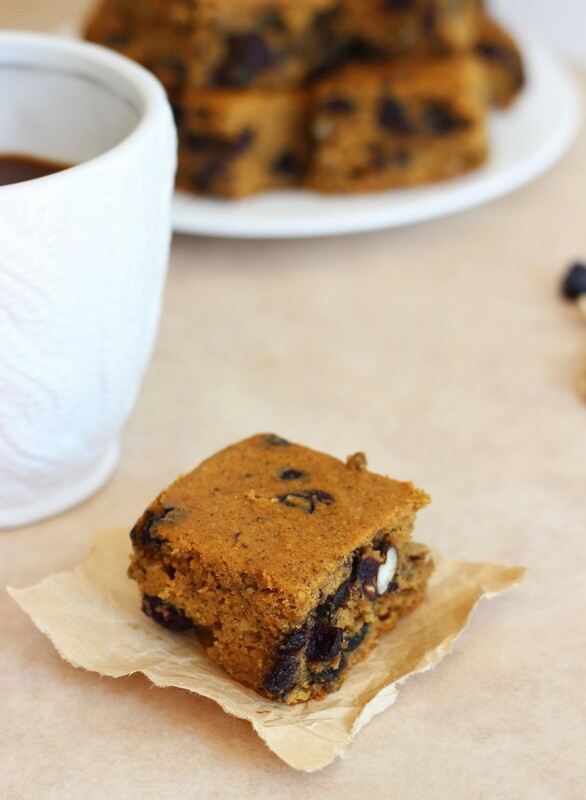 A moist and delicious pumpkin protein bar with nuts, dried blueberries, dried cranberries, and lots of cinnamon and spices! 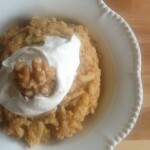 In a large bowl, combine brown sugar, applesauce, pumpkin, egg whites, almond milk, and vanilla. 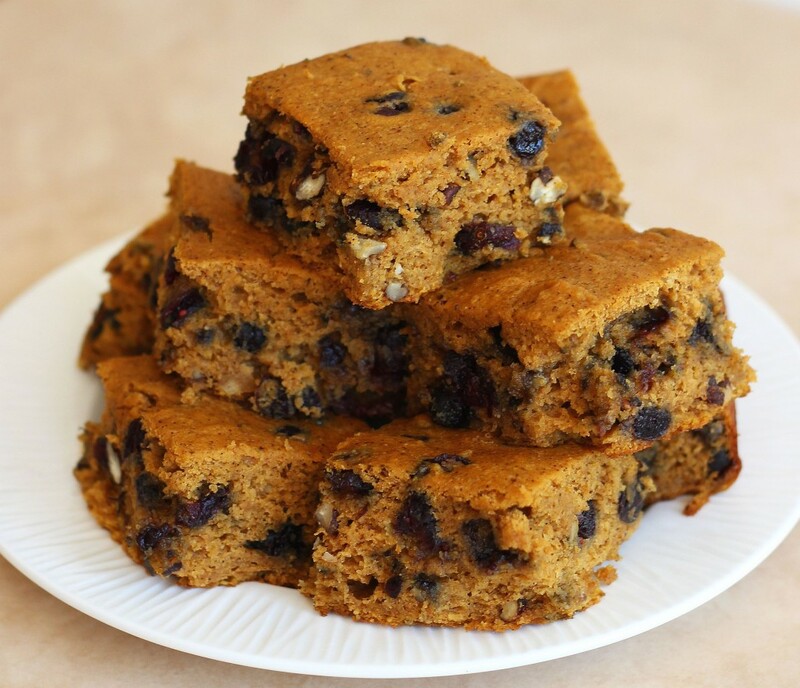 In another large bowl, combine oat flour, protein powder, spices, baking powder, baking soda, and salt. Add dry ingredients to wet ingredients, and mix until just combined. 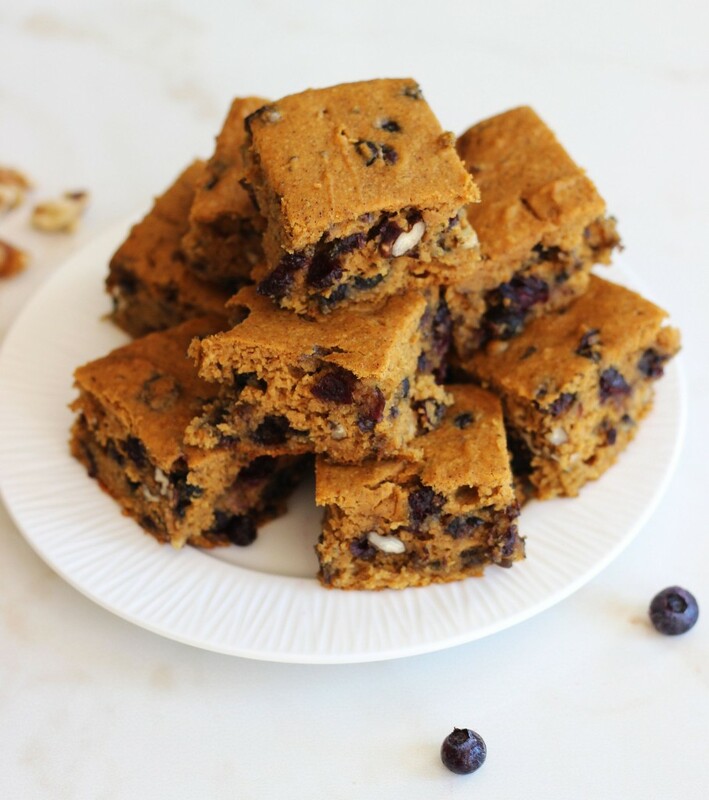 Stir in nuts, blueberries, and cranberries. Bake at 350 degrees for 18-22 min, or until edges are golden brown and a toothpick inserted near center comes out clean. Cool. Cut into bars. Enjoy! My favorite brands of protein powder to bake with are Trutein and BSN Lean Dessert protein. I typically make these with Trutein's Cinnabun or Vanilla flavors. Just look at ’em. Do they look healthy? They totally are though! Pinned, Sarah! These look awesome! Adding them to my must-make list! I love when I can sneak in some extra protein…especially if it’s in a “bar” or dessert-like treat. Hi Blair! Thanks so much! They truly don’t taste healthy, and they’re very dessert-ish. 🙂 We love them and make them often! They’re great for on-the-go! Let me know if you try them! Happy Friday! I could never get sick of pumpkin, so keep ’em coming, Sarah! I love the looks of these protein bars! Sounds like such a delicious and healthy treat to snack on throughout the day. And I love that you added blueberries and cranberries, too! I am still not sick of it either. I keep waiting for it to happen, but I can’t get enough! And I have other pumpkin things in the queue still – you probably do too!! 🙂 Have a great day, Gayle! I never get sick of pumpkin recipes. They’re all so good. Never tried pumpkin and blueberries together though, apparently I’m missing out and need to make more pumpkin stuff! These look great Sarah! these bars look great! loving the combination of pumpkin, blueberries and cranberries! 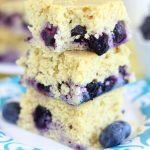 🙂 these would be perfect as a post-workout snack! Yes! I totally agree! Carbs + protein make these perfect for that! I love them for breakfast too because I must have carbs at breakfast or I’m a slug! 🙂 Thanks so much for your comment, Manali! Yum! I’m totally going to try these. 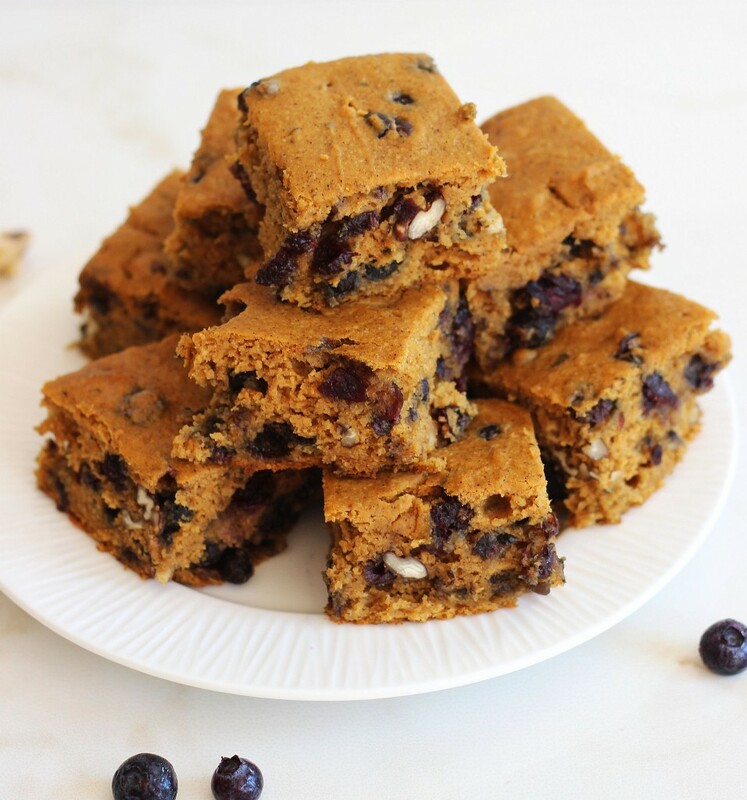 These bars are packed with flavors and vitamins! Thanks for coming and linking up at The Weekend Social. All posts get pinned in our pinterest board! Please be sure to come back next week starting Thursdays at 9PM EST on culinaryflavors.gr ! I hope to see you there! 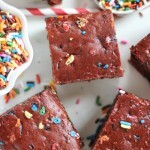 These look delicious, and I can’t wait to try the recipe! Thanks for joining us last week. These look too good to be healthy, yum! Thanks for linking up to Sweet and Savoury Sunday, stop by and link up again. Have a great day!! Taste too good to be healthy too! 🙂 Thanks for the party, Laura! i know that I already commented on this post back in October, Sarah…but I’m back today because I wanted to tell you that I will be making them (and devouring them) this week! 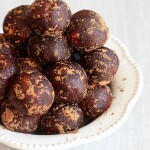 Love a new healthy recipe, and these will be perfect snacks for us! Can’t wait to try this! Thank you so much for linking up at Tasty Tuesday!